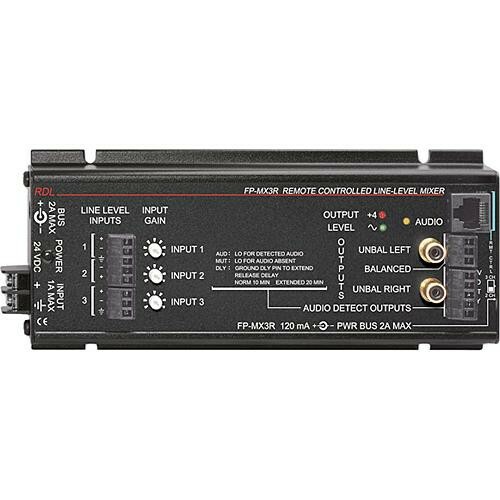 The RDL FP-MX3R Remote Controlled Line Level Mixer is the ideal choice where a user accessible mixer must control the volume of multiple sources in a commercial audio installation. The mixer accepts balanced or unbalanced audio sources through a detachable terminal block. Both balanced and unbalanced outputs are provided. Two unbalanced outputs are available to feed the mono mixer output to a stereo amplifier input. Remote control of the mixer allows audio signals to be kept at a single equipment location. Audio is mixed by VCA circuits that are adjusted by control signals from the remote control. Box Dimensions (LxWxH) 10.7 x 4.5 x 2.4"